It can be argued that one of the significant benefits of Nanoscience as a discipline has been the merging of scientists of diverse backgrounds to address challenges that face us today. One such challenge is to study and construct nanoscale motors. A variety of definitions exist for “motors”, however, it should suffice to say that a motor is a device or machine that converts other forms of energy into mechanical energy. Nature has its own versions of motors which are essentially super-efficient machines operating at very tiny scales. These biomolecular motors convert chemical energy into mechanical work or motion, exhibiting remarkable control and precision, very often at levels rarely seen in man-made motors, and form the basis of cellular function. Thus, there has been tremendous interest in understanding these nanomachines, either to mimic their action or to incorporate them into novel devices. The purpose of this overview is to gloss over some outstanding examples of nature’s motors with specific emphasis on topics that were covered in the Special Session on Biomolecular Motors at Nanotech 2004. The typical biomolecular motor is a protein that uses free energy from ATP (Adenosine Tri-phosphate) or other nucleotide triphosphate (NTP) hydrolysis as its fuel to produce mechanical force. ATP is the universal currency of energy in biological systems and, in almost every living cell, is generated from glucose by a sequence of reactions called glycolysis. The hydrolysis of ATP to AD(di)P and inorganic phosphate is energetically favorable and the pool of ATP in a cell is far higher than that of its hydrolysis products, hence serving as a remarkable store of chemical energy that is used to perform the various cellular functions. Motor proteins are involved in several critical cellular processes and have functions ranging from ATP synthesis, organelle transport, muscle contraction, protein folding and nucleic acid translocation. Their involvement is crucial in cell signaling, division and motion and depends on the cell type. To truly understand the role of molecular motors, one has to come to terms with the myriad activities that take place in a cell, the membrane bound sac filled with several components. These motor-dependent activities begin with DNA replication and transcription followed by protein production and transport, forming an integral part of cellular function. DNA replication is a required step before cells divide. The proteins involved in this intricate process act in concert as a replication machine. A motor protein called a helicase  opens up the DNA double strand along with a DNA polymerase molecule. While one daughter (leading) strand is synthesized directly by the polymerase, the second (in opposite orientation OR lagging strand) is synthesized in intervals. This highly coordinated and efficient process also involves a proof-reading capability that prevents mismatches from being incorporated into the newly synthesized strands. Further, the DNA helix is made up of turns every 10 base pairs requiring a protein called a DNA topoisomerase  that breaks a phosphodiester bond and retains the energy for subsequent re-sealing. (for additional reading on this topic, see Chapter 5, pp236 of “Molecular Biology of the Cell”. Alberts et al. Garland Publishers). Members of the type IIA family of topoisomerases include bacterial DNA gyrases, topoisomerase IV and also eukaryotic II, all with similar structures but induction of topological transformations in different directions consuming ATP in the process of simplifying DNA topology, essential during the replication process. Fig. 1: Motor activity of type 1 R M Enzyme. (a) The yellow block represents the DNA-binding (recognition) site of the enzyme, which is represented by the green object approaching from the top of the screen and about to dock onto the recognition sequence. (b) The motor is bound to the DNA at the recognition site and begins to attach to adjacent DNA sequences. (c) The motor begins to translocate the adjacent DNA sequences through the motor/DNA complex, which remains tightly bound to the recognition sequence. (d) Translocation produces an expanding loop of positively supercoiled DNA. The motor follows the helical thread of the DNA resulting in spinning of the DNA end (illustrated by the rotation of the yellow cube). (e) When translocation reaches the end of the linear DNA it stops, resets and then the process begins again. Another interesting set of enzymes are the restriction nucleases, made by bacteria to protect them from viruses. First reported by Arber in 1962, these enzymes recognize specific sequences, often 4-6 base pairs long and palindromic, and cleave them. When these sequences occur in the bacterial genome itself, they are generally methylated to prevent degradation. Restriction enzymes have been the cornerstone of recombinant DNA technology or genetic engineering as we know it today, allowing the manipulation of genes for several applications. Type I restriction enzymes are perhaps the most complex of this class of enzymes and are multimeric, composed of three subunits, each of which have distinct functionalities. Type I enzymes cut distal to their recognition site and hence possess DNA translocation capability driven by ATP hydrolysis . The HsdR subunit is purported to be the motor subunit and overexpression of this subunit from the EcoR124II suggests that this subunit may be capable of independent enzyme activity . In a project funded by the European Community as part of a Future Emerging Technologies initiative, Keith Firman and colleagues have produced a hybrid enzyme favoring a subunit composition that reproduces the motor function . This hybrid molecule acts as a unidirectional motor that can be used as a nanoactuator. Figure 1 can be viewed as a movie at http://www.nanonet.org.uk/nanotechnology.asp. The next step then is to actually use the genetic information contained in the DNA. This is initiated by the process of DNA transcription that results in the formation of mRNA or messenger RNA that are carriers of information. This process is carried out by the RNA polymerase that recognizes a promoter that contains a start site and makes a RNA copy of specific DNA sequences. One of the better studied examples of RNA polymerases is the T7 RNA polymerase , a single subunit enzyme that single handedly carries out all of the transcription processes. During the stepwise transcription process, the T7 RNAP can exert forces up to 30 pN (linear force) or 5 pN•nm (torque). This protein has several features that are advantageous to harnessing its capabilities of doing work. William McAllister’s group at SUNY Downstate Medical Center in Brooklyn, NY is spearheading a project using the T7 RNAP as an information-dependent molecular stepper motor . They have modified the protein to carry diverse payloads (both biological and non-biological) and have demonstrated it to be immobilized on a grid, allowing controlled movement. Arrays of such a motor could have tremendous applications in fields such as nanorobotics. It is critical for the RNA polymerase to be stopped at the right time and place for regulated gene expression. The T7 RNA Polymerase recognizes two sites, either of which may be sufficient to pause and terminate transcription [8, 9]. Another major method used in bacteria relies on a protein called “Rho factor” (reviewed in ). Rho, a homohexamer of 47 kDa subunits binds to the RNA and uses energy from ATP to move along till it reaches the polymerase and disengages it from the site of transcription. Rho shares sequence similarity with the F1-ATP synthase (described in more detail later) where ATP hydrolysis is converted to rotary motion. In case of Rho, however, the energy from hydrolysis results in translational motion. It is proposed that Rho’s interaction with RNA alternates between tight and loose binding phases as a result of ATP binding and subsequent hydrolysis [11, 12]. The mRNA thus synthesized codes for specific amino acid sequences that are added on by another class of RNA called transfer or tRNA. These molecules bind on one end to a codon (triplet) on the mRNA and the other end to the specific amino acid specified by the codon. This process of translation is highly complex and is carried out by the ribosomal machinery and the resultant protein molecules are directed to desired locations within the cell to carry out designed functions. While the processes described earlier take place in the nucleus, a distinct compartment within the cell, subsequent processing of the mRNA needs to occur in the cytoplasmic compartment. A double membrane called the nuclear envelope separates these compartments. Effective exchange of molecules through this envelope is mediated via pore called nuclear pore complexes (NPCs) . 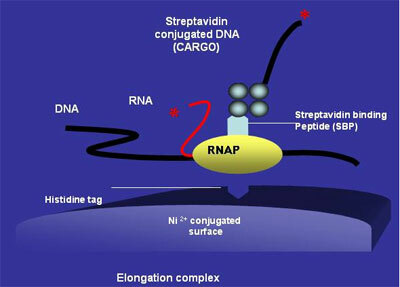 While molecules such as RNAs are translocated out of the nucleus, other molecules are imported in and in some cases, molecules make several traversals. Given the complex role of the NPC, it comes as no surprise that it will be a sophisticated moiety, involving several proteins and nearly 55 MDa in size. It appears that the bulk of the transport occurs through a cylindrical pore  and requires energy from ATP hydrolysis. Drawing inspiration from this highly complex architecture, Ramana Pidaparti and colleagues  have devised a MEMS pump for material transfer and have explored detailed mechanical models to create a device based on the NPC supramolecular structure. Earlier on we mentioned that glycolysis is a major source of ATP production. This is true for most anaerobic organisms and tissues that function under such conditions. The net production of ATP however is only two molecules per cycle. In contrast, most animal cells oxidize the pyruvate from glycolysis and harness the energy produced. This process takes place in the mitochondria. A similar process takes place in plants in their chloroplasts, with the difference being their source of energy, sunlight. ATP synthetase or F0F1 ATPase, a large complex of polypeptide chains synthesizes ATP using the flow of protons down an electrochemical gradient while also using ATP hydrolysis to pump protons across the inner mitochondrial membrane; thus it is a reversible coupling device. Both the F1 and F0 portions are rotary motors. The F1 has been structurally characterized and is made up of 3a and 3b subunits arranged around the g subunit (Fig 4), which contacts the F0 part which is membrane bound. Very recently, Itoh et al. presented direct evidence for the chemical synthesis of ATP driven by mechanical energy by attaching a magnetic bead to the g-subunit of F1-ATPase and rotating it. Rotation in the appropriate direction resulted in ATP production. The rotary activity of F1-ATPase has been harnessed to develop motor prototypes by several groups. Noji et al. visualized rotation by attaching an actin filament to the F1 ATPase and a similar example is shown in figure 5, which is an artistic rendering of a hybrid nano-propeller system fabricated in the Montemagno group . This device provided over two hours of continuous rotation with a mean torque of ~ 20 pN nm at 50% efficiency. Fig. 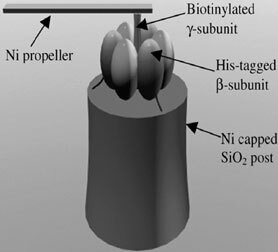 5: Artistic rendering of a hybrid nano-propeller system fabricated in the Montemagno group . In the realm of ATP-driven linear biomotors, the most prominent examples are dynein, kinesin and myosin, which is involved in muscle contraction. Muscle contraction is a sophisticated process involving actin and myosin and is a result of actin filaments sliding on myosin heads. Actin filaments are formed of 375 amino acid long subunits that are associated with ATP. Myosin transport along actin is not limited to muscle contraction, and is involved in several cellular transport processes. While muscle myosin works in a non-processive manner, a single myosin V protein takes many steps along the actin filament without dissociating. Numerous studies have been devoted to understanding the mechanism of myosin V motion along actin (nicely reviewed in ) and it is thought that the two heads of the myosin V dimer move along in a hand-over-hand mechanism based on the ~74nm displacements observed by fluorescent labeling methods. While the mechanism of actin-myosin motility is quite well understood, the biggest challenge lies in adapting these biomotors into usable devices, efforts on which are still at a nascent stage. Modeling and simulation of motor protein activity under “device-like” conditions could prove extremely beneficial to feasibility studies. Dan Nicolau has proposed a mechanistic model  to understand the physical characteristics of actin motion on a myosin-coated surface. The actin filament is modeled as a chain of spring-connected beads that imposes a limitation on the stretching of the filament. The dependence on ATP concentration and other relevant factors have been integrated and interactions of each monomer with a myosin head are examined as opposed to treating the filament as a complete entity. Their results thus far indicate that a Brownian ratchet mechanism (see  for an overview on ratchet mechanisms in molecular motors) combined with a stochastic ATP hydrolysis cycle model can effectively predict the directionality and other aspects of actin motility. Amar Flood  and his colleagues from the Stoddart group at UCLA have proposed the design of artificial motors based on the linear molecular motors that can function in a non-aqueous environment. Chemical energy for such a system would be harnessed from a proton gradient in a power diffusive two stroke cycle. The mechanical energy thus generated will then be amplified by arraying these motors  akin to muscles in the human body. 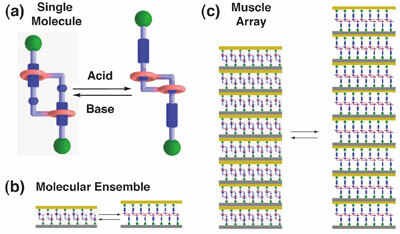 Fig7: (a) The simple chemically powered contraction and extension of a linear molecular muscle could be (b) integrated into a monolayer assembly that will allow (c) higher order systems to amplify the nanoscale motion for macro scale applications. Much like myosin, kinesin also moves along a track, in this case, microtubules, and is responsible for transporting cellular cargo such as organelles and signaling molecules. Kinesin is a dimeric motor protein with the two heads of the dimer connected via a coiled-coil a-helical interaction . This protein takes 8.3 nm steps along microtubules in a hand-over-hand walking manner. [25, 26]. In spite of several studies describing the stepping mechanism, a detailed picture of the regulation of ATP hydrolysis with the walking process still remains to be clearly elucidated. In contrast with myosin and kinesin, dynein, another microtubule-based motor, is a huge protein with a heavy chain polypeptide > 500 kDa as its largest subunit. The heavy chains are responsible for ATPase activity. Dyneins are members of the AAA+ (ATPases associated with various cellular activities) superfamily and possess six concatenated AAA modules within the same polypeptide chain, of which AAA1 appears to be the site of ATP hydrolysis . Due to difficulties with handling this protein, relatively less is known about its mechanism of action. Of the several dynein forms, two are cytoplasmic and are involved in many cellular functions . Axonemal dyneins on the other hand are primarily involved in ciliary and flagellar movement. The organization of the dynein motor domains is also relatively more complex than that of myosin/kinesin. Dynein is a three headed molecule with each head interacting with a microtubule via a stalk that presumably acts as a lever and also transmits ATP hydrolysis signals to alter affinity for the microtubule (see  for a review on possible mechanisms). Burgess et al. have used electron microscopy and image processing to provide the basis for a model for dynein’s powerstroke and suggest a new model for the structure and mechanism of dynein c, a flagellar isoform from Chlamydomonas reinhardtii. Their proposed mechanism suggests that a change in head–linker orientation is fundamental in the power stroke of dynein. Biomotors are not restricted to animal cells as seen in the final example in this overview. Forisomes ( and references therein) are plant motors that enable long distance transport in a natural microfluidics system. These elongate protein bodies of up to 30 µm length are found in the highly specialized cells in the phloem of vascular plants that form a continuous microtube system enabling pressure driven long distance transport of photo-assimilates. The forisomes act as reversible stopcocks by undergoing rapid conformational changes which involve more than three-fold increases in volume. The conformational switch is controlled by Ca2+ with a threshhold concentration in the nM range. These proteins have tremendous potential as reversible switches in integrated microfluidic systems and, as presented by Michael Knoblauch, construction of prototypic micro-devices with forisomes as actuators is a current effort. S. Iyer. acknowledges research support from the LANL LDRD program and the U.S. DOE NSET. Los Alamos National Laboratory is operated by the University of California for the United States Department of Energy. M. Laudon and B. Romanowicz acknowledge research support from the DARPA Defense Science Office into the NSTI Emerging Research and Education Program. Jeong, Y.J., M.K. Levin, and S.S. Patel, The DNA-unwinding mechanism of the ring helicase of bacteriophage T7. Proc Natl Acad Sci U S A, 2004. Trigueros, S., et al., Asymmetric removal of supercoils suggests how topoisomerase II simplifies DNA topology. J Mol Biol, 2004. 335(3): p. 723-31. Endlich, B. and S. Linn, The DNA restriction endonuclease of Escherichia coli B. I. Studies of the DNA translocation and the ATPase activities. J Biol Chem, 1985. 260(9): p. 5720-8. Zinkevich, V., et al., The HsdR subunit of R.EcoR124II: cloning and over-expression of the gene and unexpected properties of the subunit. Nucl. Acids. Res., 1997. 25(3): p. 503-511. Firman, K. A, Molecular Motor that links the biological and silicon worlds. in Nanotech2004. 2004. Boston, MA: NSTI. McAllister, W.T. and C.A. Raskin, The phage RNA polymerases are related to DNA polymerases and reverse transcriptases. Mol Microbiol, 1993. 10(1): p. 1-6. McAllister, W.T. in Nanotech 2004. 2004. Boston, MA: NSTI. Dunn, J.J. and F.W. Studier, Complete nucleotide sequence of bacteriophage T7 DNA and the locations of T7 genetic elements. J Mol Biol, 1983. 166(4): p. 477-535. Mead, D.A., E. Szczesna-Skorupa, and B. Kemper, Single-stranded DNA 'blue' T7 promoter plasmids: a versatile tandem promoter system for cloning and protein engineering. Protein Eng, 1986. 1(1): p. 67-74. Richardson, J.P., Rho-dependent termination and ATPases in transcript termination. Biochim Biophys Acta, 2002. 1577(2): p. 251-260. Xu, Y., H. Kohn, and W.R. Widger, Mutations in the rho transcription termination factor that affect RNA tracking. J Biol Chem, 2002. 277(33): p. 30023-30. Xu, Y., et al., ATP binding to Rho transcription termination factor. Mutant F355W ATP-induced fluorescence quenching reveals dynamic ATP binding. J Biol Chem, 2003. 278(16): p. 13719-27. Gorlich, D. and U. Kutay, Transport between the cell nucleus and the cytoplasm. Annual Review of Cell and Developmental Biology, 1999. 15(1): p. 607-660. Stoffler, D., Cryo-electron Tomography Provides Novel Insights into Nuclear Pore Architecture: Implications for Nucleocytoplasmic Transport. Journal of molecular biology, 2003. 328(1): p. 119. M.J. Knieser, R.P., F. Kadioglu, R.D. Harris, M.R. Knieser, A. Hsu. MEMS Biofluidic Device Concept Based on a Supramolecular Motor. in Nanotech 2004. 2004. Boston, MA. Itoh, H., et al., Mechanically driven ATP synthesis by F1-ATPase. Nature, 2004. 427(6973): p. 465-8. Noji, H., et al., Direct observation of the rotation of F1-ATPase. Nature, 1997. 386(6622): p. 299-302. Soong, R.K., Engineering Issues in the Fabrication of a Hybrid Nano-Propeller System Powered by F_1-ATPase. Biomedical microdevices, 2001. 3(1): p. 71. Vale, R., Myosin V motor proteins: marching stepwise towards a mechanism. The Journal of cell biology, 2003. 163(3): p. 445-50. Nicolau Jr. D.V., N.D.V. 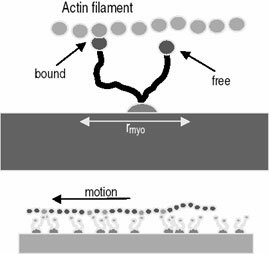 A Mechanistic Model of the Motility of Actin Filaments on Myosin. in Nanotech 2004. 2004. Boston, MA: NSTI. Astumian, R.D., Making molecules into motors. Sci Am, 2001. 285(1): p. 56-64. Flood, A.H.e.a. Biomimetic Molecules as Building Blocks for Synthetic muscles. in Nanotech 2004. 2004. Boston, MA: NSTI. Balzani, V.V., et al., Artificial Molecular Machines. Angew Chem Int Ed Engl, 2000. 39(19): p. 3348-3391. Kozielski, F., et al., The crystal structure of dimeric kinesin and implications for microtubule-dependent motility. Cell, 1997. 91(7): p. 985-94. Yildiz, A., et al., Kinesin walks hand-over-hand. Science, 2004. 303(5658): p. 676-8. Asbury, C.L., A.N. Fehr, and S.M. Block, Kinesin moves by an asymmetric hand-over-hand mechanism. Science, 2003. 302(5653): p. 2130-4. Burgess, S.K., PJ|, Is the dynein motor a winch? Current opinion in structural biology, 2004. 14(2): p. 138-46. Vallee, R.B., et al., Dynein: An ancient motor protein involved in multiple modes of transport. J Neurobiol, 2004. 58(2): p. 189-200. Vallee, R.B. and M.A. Gee, Make room for dynein. Trends Cell Biol, 1998. 8(12): p. 490-4. Burgess, S.A., et al., Dynein structure and power stroke. Nature, 2003. 421(6924): p. 715-8. Knoblauch, M.e.a. Forisomes: Mechano-Proteins that Exert Force in Contraction and Expansion. in Nanotech 2004. 2004. Boston, MA: NSTI.